Colt brings back two short-barreled versions of the Single Action Army. One of the most iconic and romantic of frontier-era handgun designs, the Colt Single Action Army, is back. However, it is not the standard Peacemaker to which I am referring but two of its rarest variations: the three-inch barreled Sheriff's Model and the four-inch Storekeeper. Both of these guns are being brought back to life by Colt Manufacturing Company, the very entity that created them. Over the years there has been a tremendous amount written about the Peacemaker, but up until now, very little has been published about the short-barreled, ejector-less versions of the Single Action Army. The Single Action Army first made its appearance sporting a 7½-inch barrel at the U.S. Ordnance Department field trials in the autumn of 1872. There, the Colt's simple yet rugged design won out over the competing Merwin & Hulbert, Remington and Smith & Wesson revolvers, and in 1873 the Single Action Army became the official sidearm of the U.S. Army. But like many military handguns before and after, Colt's single action soon was embraced by the civilian population as well. Originally, the Peacemaker was chambered only in .45 Colt, but in 1878 the popular .44-40 was added to make the Single Action Army compatible with the 1873 Winchester. Eventually the Single Action Army would be chambered for no less than 36 different cartridges, ranging from .22 rimfire to .476 Eley. But it was .45 Colt and .44-40 that remained the two most popular calibers throughout the revolver's lifetime. In 1875, as a result of civilian shooters wanting a Peacemaker that could clear leather faster than the cavalry model, Colt added a 5½-inch barrel, followed by a 4¾-inch barrel introduced in 187 that soon became the most popular of the three standard factory-produced barrel lengths. See the trend? As the Peacemaker gained in popularity, especially among outlaws and lawmen, its barrel became progressively shorter. But even though Colt offered to make any barrel length for a cataloged price of $1 an inch over the standard cavalry version, we see no such offer for barrels measuring less than 4¾ inches. And yet such factory guns exist because, for many, shorter was better. The caliber stamping takes up half the length of the Sheriff's Model three-inch barrel. One of the first to realize this was Texas outlaw Sam Bass, who cobbled together not one but three Colt revolvers to make a .44-40 snubby. As displayed in the Frazier International History Museum in Louisville, Kentucky (fraziermuseum.org), Bass assembled his makeshift pocket pistol out of parts from a Colt 1872 Open Top with a cut-away trigger guard, a Single Action Army and an 1878 Colt Lightning. The reliability of this improvised contraption is open to conjecture, but the revolver appears to have seen plenty of use. Another devotee of the ultra-short barreled Single Action Army concept was Missouri's folk-hero bandit Jesse James, who simply removed the ejector from a Colt Peacemaker and unscrewed the barrel. One can only imagine how this gun must have shot. Recoil and muzzle blast aside, without a rifled barrel, accuracy was a moot point. But that wasn't the purpose of Jesse's homemade belly gun; he simply wanted a big-bore revolver that was relatively concealable and would get him out of a jam in a hurry. But a much more practical solution to the Jesse James version would have been to leave at least enough barrel on the gun to provide some spin for the bullet, if not a sighting radius. The first such gun produced by Colt's Hartford factory was a 2½-inch barreled, ejectorless Single Action Army that was shipped in 1882 (ironically, the same year Sam Bass was gunned down, thus proving his hodgepodge of mismatched parts was not the answer). Current-production Sheriff's Models and Storekeepers feature the historically correct three-line address on a case-hardened frame. This snub-nosed Colt may have been part of an order of 3½- and four-inch single actions shipped on February 22 of that year to Chicago distributor Hibbard, Spencer, Bartlett & Company. According to Colt collector Wynn Paul and as cited in The Blue Book of Gun Values, these single actions left the factory in two shipments of 10 guns each. Subsequent orders for Peacemakers with barrel lengths of 2½, three, 3½ and four inches continued to be placed throughout the remainder of the 19th and first part of the 20th centuries, with many shipped to lawmen in the Southwest. By the time production ended in 1940 with what has come to be called "first generation" (i.e. prewar) Single Action Armys, out of a total run of 357,859 guns, approximately 1,400 were of the ejector-less short-barreled variety. And of these, only 40 were factory engraved, making any of these versionsâ€”no matter their conditionâ€”highly desirable among collectors. Naturally, fakes are rampant. Originally, Colt never used the Sheriff's Model and Storekeeper designations in any of its literature. It was collectors, beginning in the 20th century, who coined these terms for the three- and four-inch guns respectively. The Storekeeper was also known as the House Gun, although the Storekeeper name seems to have stuck with present-day fans, while the House Gun moniker has drifted into obscurity. Interestingly, both the House Gun and Storekeeper names may have originated in the 1940s or '50s by the late James Serven, who eschewed the Sheriff's Model label. As the noted firearms dealer and author huffed in his classic book, Colt Firearms, "â€¦I doubt that any self-respecting sheriff would arm himself with a Single Action Army Colt with a 3" barrel." Nonetheless, it was the three-inch Sheriff's Model that first made a reappearance in modern times. In 1955, thanks to a proliferation of television Westerns and the subsequent national craze for the sport of fast draw, the Colt Single Action Army was put back into production. These guns are now referred to as "second-generation" Single Action Armys, and by 1958 all three original barrel lengths were again being made. tennial Arms Corp. in Chicago contracted with Colt to produce a limited run of 503 Sheriff's Models, of which 478 were blued and case hardened and 25 were nickel plated. Of these, four were engraved. Per 19th century originals, the pre-1892-style blackpowder frame requires a screwdriver to remove the cylinder base pin. Offered only with a three-inch barrel in .45 Colt, these guns had their own set of serial numbers, all ending in "SM." They were priced at $140, about $15 higher than the standard Single Action Army at the time. But with no ejector rod and a short barrel, they were largely deemed impractical and were slow to sell. Today, of course, these second-generation Sheriff's Models are eagerly sought by collectors. Because of its ill-timed and poor reception, the Sheriff's Model wasn't resurrected until 1980, this time as an addition to the "third generation" of Colt single actions, which resumed production in 1976 after a brief hiatus to replace aging machinery. Interestingly, it was this Sheriff's Model, which was available in nickel as well as blue and case-hardened finishes, that also launched the reintroduction of the .44-40 chambering for the third-generation Single Action Army. Later, a cased, French-fitted set containing an extra cylinder in .44 Special was also offered. This time the once-shunned Sheriff's Model met with acceptance, although I recall picking up one such gun for a bargain price at a gun show back in the 1990s for the same reason the guns didn't sell in the 1960s: With its short, ejector-less barrel, the owner found it "undesirable" as a shooter. Hacker found the extra inch on the barrel of the Storekeeper gave it better handling qualities than the three-inch Sheriff's Model. But by this time collectors had come into their own, and while many Sheriff's Model were acquired, few were fired. Plus, an increasing number of Sheriff's Models were being ordered from the Colt Custom Shop with special features such as beveled cylinders, engraving and gold plating. In 1984 a .45 caliber Sheriff's Model was introduced that featured a pre-1892 blackpowder-style frame and incorporated a cylinder base-pin screw instead of the post-1892 spring-loaded plunger. That same, yearâ€”no doubt due to the success of the Sheriff's Modelâ€”the Storekeeper was brought back for the first time since the pre-war years. These guns were offered in .45 Colt only and with nickel, blue and cased-hardened, or (rarest of the three) all-blued finishes. As all single actions were then being made in the Colt Custom Shop, most Storekeepers were fitted with one-piece ivory grips, and all had blackpowder-style frames with three-line patent date stampings. These guns were produced until 1985, with only 284 made. Thus they are among the rarest of the modern-day short-barreled Colts. Therefore, one can understand my excitement when I learned last year that the blackpowder-frame Sheriff's Model and Storekeeper were both going to be reintroduced. Available in either .44-40 or .45 Colt, they feature a blued and case-hardened finish with three-line patent-date stamping, two-piece black composite "eagle" grips, and correct two-line address on the barrel. And like all current Single Action Armys, the guns have the first- and second generation-style separate cylinder pin bushing. It was only been recently that I was finally able to acquire a .45 caliber Storekeeper for testing. While these historic reissues will obviously be snapped up as investments by collectors, I have always felt that the Colt Single Action Army was meant to be shotâ€”no matter what its barrel length. That also means that these guns have to be carried, but although they will obviously fit into any Single Action Army holster, there are few rigs designed specifically for a Sheriff's Model or Storekeeper. I contacted Jim Lockwood of Legends In Leather, and together we designed the Hacker Hi-Ride specifically for the Storekeeper. For many years I packed a third-generation Sheriff's Model as a camp revolver on hunts, so I was familiar with how it handled. Frankly, that three-inch barrel always seemed to feel like it wasn't there, as the short tube shifted the center of gravity to the frame. But there was a noticeable difference with the Storekeeper's four-inch barrel. With just one additional inch of steel, the weight shifted slightly forward, and the gun balanced better. Consequently, the Storekeeper was much more comfortable when it came to aiming. 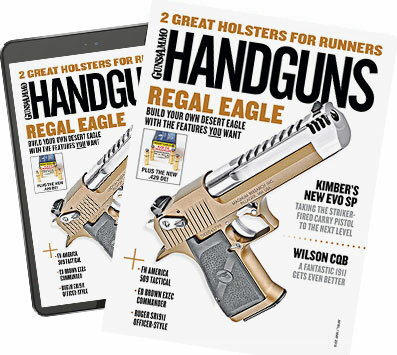 Of course, the familiar plow-handled grip and gracefully curved hammer spur of either gun are two of the most ergonomically shaped components a handgun shooter could want. Obviously, with their grooved topstraps for rear sights and shark's fin-shaped steel front sights, neither the Sheriff's Model nor the Storekeeper are intended to be tack drivers. Nonetheless, I fired five-shot strings at 25 yards with Winchester 225-grain Silvertip hollowpoints, Federal 225-grain semi-wadcutters, and Black Hills 250-grain roundnose Cowboy loads. The Storekeeper preferred the Silvertips, printing a 3¼-inch group with two of the holes touching. Federal wadcutters yielded a 3½-inch group. Black Hills Cowboy loads, which usually perform well in my single actions, spread out to 4¼. Without an ejector rod, empties must be punched out with the cylinder base pin or similar object. Being a hand-fitted gun, I was pleased with the smoothness and timing of the action, although I would probably have a minor tune-up to lighten the trigger, bolt and mainsprings. And having no ejector rod hinders the already slow reloading process, as empties must be punched out 19th century-style with the cylinder base pin or with a pen or pencil. As with all single actions of this type, the hammer should be resting on an empty sixth chamber. heriff's Model and Storekeeper are again available with the coveted rampant Colt on the frame. Collectibility aside, they serve the same purpose for which they were originally intendedâ€”as a close range, big bore backup. As such, they feel right at home in a high-ride holster or inside a drawer. And you don't have to wear a badge or own a store to do so.